Ace2Three is famous is bringing some of the biggest online rummy tournaments, promotions and offers. To celebrate the 69th Republic Day of India, they have announced a freeroll rummy tournament with a prize pool worth Rs.5 lakhs. The tournament is open for all players who play rummy online at this website for real money. If you are a premium player, visit the ‘Tournaments’ section in the Ace2Three website and book your seat for the exclusive rummy tournaments for Free. If you play rummy online for free, purchase chips of the minimum amount of Rs.100 and play at least one real money game to qualify for all upcoming tournaments and promotions meant for premium players. Ace2Three is one of the biggest portals to play cash rummy games, and so, you wouldn’t want to miss out on the opportunity of winning big while enjoying the game. The Republic Day rummy tournaments at Ace2Three will start running from 26th January 3:00 PM. The premium players at the site can book their seat for free and play against a maximum of 18,500 players for a big prize pool worth Rs.5 lakhs. 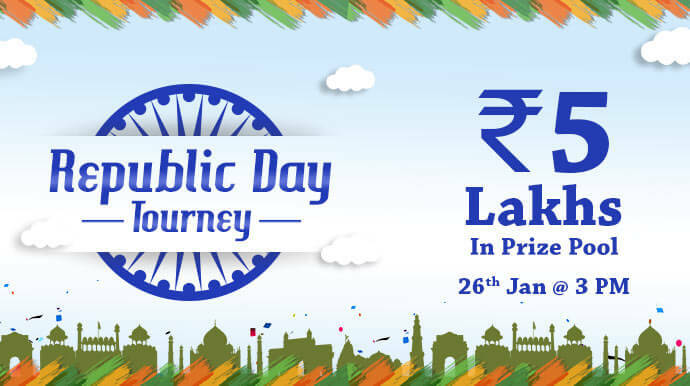 There will be 1000 winners from this Republic Day special rummy tournaments who will be sharing the big prize pool. The complete details of the rummy tournaments are as shown in the table below. To book your seat login to your account and click on the Tournaments tab. Visit the ‘Special’ tab and book your seat for the Republic Day rummy tournament for free. If you have feedback on gameplay or tournaments at Ace2Three, post it in the comment section below. Also, subscribe to RummyMania.com and get the latest news on websites where you can play rummy online in the best way possible!